Knowing how much you have spent on your medical bills and how much more you owe is very important for people who are experiencing medical issues. Being aware of your medical expenses can help you stay organized and prevent the situation from escalating during the times of emergency. Most of the health care providers also face this issue where the medical expenses in the form of billing statements keep piling up until they become difficult to pay off. If you’re one of that individual who has been in this mess, then using the patient medical tracker can fetch you amazing results. 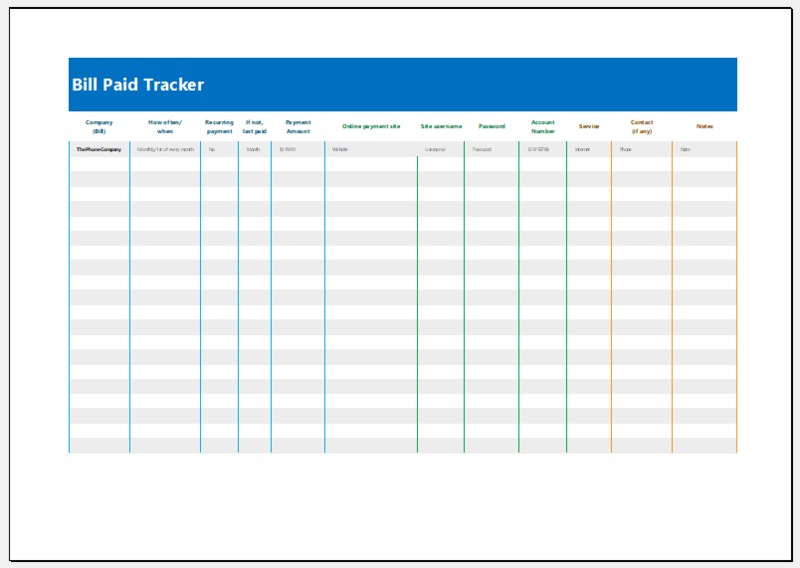 The patient medical bill tracker template designed in Excel is a valuable tool for patients. It allows you to keep track of your medical bills regardless of where you are. This unique template provides patients with great flexibility. No matter where you are, you can easily go through the template using a computer or just a Smartphone. 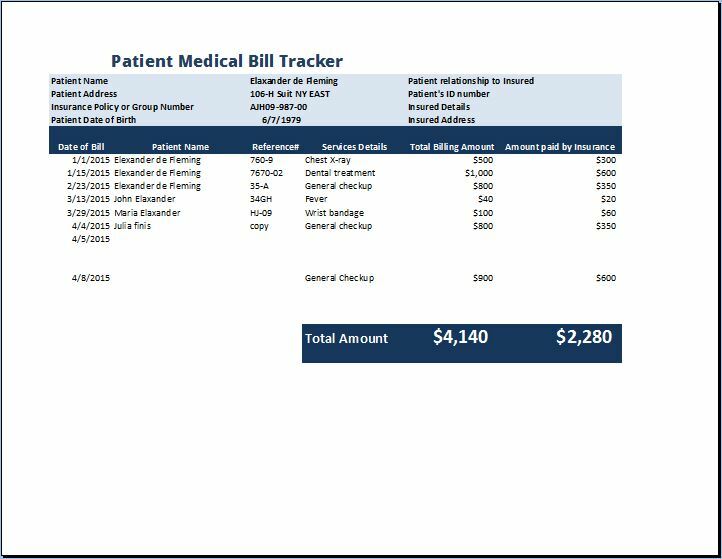 The given bill tracker works through stating crucial details such as what the insurance is paying you for your medical expenses and what you have already spent. This feature keeps you on track and ensures that you keep a balance between the expenses and the insurance money. Just insert the data such as the amount insurance company has covered; expenses out of your own pocket; services availed; the total amount and the software do the rest of the work automatically. It is also important for you to update the template whenever you bear a new expense or get paid by the insurance. Usually, in any serious case, the bills of a patient just touched the peak points and claims for health insurance. This can be much irritating for you if you are not having any appropriate bill tracking and document filing system. You should always have the most simple and convenient system, so you can concentrate on your patients and other valuable activities. There are a lot of objects that you need to track. All your medical expenses, details of appointment, details, and dosage of medicines, checks, and receipts of bills and much more stuff are needed to get tracked. So, you should always up to date about your bill info because it is a bit crucial matter. Begin with paper or electronic calendar. Record in it about all your medical appointment, test and medicines purchase, your calendar will be your full tracker of medical stuff and especially your bills. It will be much worth to you. Some people prefer to track their info about the bill or other medical stuff on paper. For tracking on paper just take a notepad and start taking records of every single info they provide you. You can also track your medical bills electronically, just use a spreadsheet program onto your computer or laptop, it will prevent the chance of losing papers or tearing of papers. You can also use other templates for keeping accurate records of bills. You will go to have many different documents and bills, so you should have a proper filing system. You can create several files for bills, payment receipt, and other documents. You should prefer to have an electronic system, it will secure your information from getting lost or torn. If you cannot manage all your document and files, then concerns anyone who is able to track your medical bills and all other essential information. They can also connect with your healthcare provider to get more information about you. Tracking your medical bills is much essential task. It will help you to be up to date.